The iPhone 7 Plus, 8 Plus, and X have double the lenses, double the fun — and they each exist to support the other. The iPhone 7 Plus, 8 Plus, and X sports a multi-camera system built into its aluminum frame. It's made up of two lenses, the wide-angle and the telephoto; the latter is closer in design to a portrait lens, but Apple calls it their telephoto option, and so telephoto is what we'll refer to it from here on out. These lenses can be fired simultaneously or individually to get you the best picture possible — depending on what that picture actually is. Want to snap a landscape? A close-up portrait in the sun? In the shade? All of these use different combinations of the camera system. NOTE: Though many (myself included) have argued that this system is closer in comparison to a normal or portrait lens than a true telephoto, I understand Apple's intentions here: Because they're marketing the lens in conjunction with a 2x feature, it may seem more appropriate to call it "tele" than "normal" or "portrait" to the average user — especially considering Apple's "Portrait" feature that utilizes both lenses. For that reason, I'm referring to the lens as Apple names it — tele, or telephoto — even though I don't necessarily agree with that branding. That's because the telephoto lens on the iPhone isn't really designed to be a stand-alone shooter, no matter Apple's "Shoot at 2x!" marketing: It shines, appropriately, when in bright light and adding detail. If you don't find yourself taking lots of sunlit images with the Camera app, however, you may not actually be looking through that telephoto lens when framing pictures as often as you might think. Wait, why? How does this all work? When you snap a picture on your iPhone, the Image Signal Processor (ISP) runs through billions of calculations to make it as good an image as possible. This includes automatically setting the speed of the shutter on your dual-lens system, the gain/ISO, exposure, color temperature, and more. The image of the bush pictured below is straight out of the Camera app, taken with the iPhone's telephoto lens at 2x mode. The multi-camera system on the iPhone introduces another question for the ISP to answer: which lens should I shoot with? In the past, the iPhone had only a digital zoom, and the ISP didn't have to worry about those questions, but now the Camera app has the option of using a secondary lens and sensor to get a better picture. Depending on the lighting, zoom level, and other conditions, the ISP automatically decides whether it should snap an image with both sensors simultaneously, just the wide-angle, or just the telephoto. Average users don't need to — and shouldn't — worry too much about these decisions; they're made by the software specifically to keep the focus on great photo-taking, not on finicky settings. But as a result, if you want to take a shot specifically with the telephoto, it's not as simple as just pressing the 2x button in the Camera app: The ISP is going to make the decision whether to use that lens or a digitally-zoomed wide-angle photo — not the user. The wide-angle sensor and lens on the iPhone is similar in many ways to the lenses and camera systems of iPhones past: It's available on all iPhone models after iPhone 7, and offers a 3.99mm framing (comparable to a traditional 28mm wide-angle view) which can be zoomed digitally up to 10x; it records to a 1/3.06-inch sensor. The wide-angle, however, shoots at a larger aperture of f/1.8, up from f/2.2. Aperture deals with light: The lower the number, the more light can shine on the sensor; the more light you have, the better images you'll get in darker rooms and under night skies. In addition, the wide-angle offers OIS (optical image stabilization) to make low-light shooting for both photographs and video an even better experience. It also has a shorter minimum focus distance (you can get closer to objects and still have them be in focus, which is great for macro photography) than the telephoto option. The telephoto lens, in contrast, shoots sports a 6.6mm (56mm equivalent) lens on the 7 and 8 Plus (52mm equivalent on the iPhone X), great for taking portraits and close-ups. Its other hardware isn't quite as high-quality as the main wide-angle sensor, unfortunately: The telephoto's aperture is f/2.8 (f/2.4 on the iPhone X), it's missing optical image stabilization, and records to a slightly smaller sensor (1/3.6 inch). Whenever possible, Apple has these two lenses and sensors work together, taking pictures simultaneously and taking the best bits of each to fill in the other's gaps. Wide-angle has a better focus? Grab that. Telephoto has better exposure and light balance? Add that to the stack. That's a drastic simplification of the work the iPhone ISP does behind the scenes (remember, billions of calculations in milliseconds), but hopefully you get the idea. Unfortunately, when it comes to shooting 2x photos, the telephoto's hardware weaknesses result in a handicapped lens when you're in poor lighting conditions — and that's where the iPhone's software takes over. I was initially rather confused when, upon snapping pictures with the iPhone at a restaurant, the telephoto images didn't look all that much better than previous years' zoomed shots. When I looked at the metadata, however, things became more clear: The images I took were actually snapped with the wide-angle lens and digitally zoomed 2x. At first, I thought this had to have been a mistake, or a goof or my part, but repeated tests confirmed my suspicions: When the Camera app is in lower-light conditions (in my tests, anything under shutter speeds of 1/30-1/60 of a second), or you're too close to an object for the telephoto to focus, it will cede control to the wide-angle and its digital zoom. You can even test this for yourself by putting your finger over the wide-angle lens and entering 2x mode: If you're in good lighting conditions, you'll see your image, same as always; if you're in lower-light, all you'll see on the screen is a dark blob representation of your finger. As I said above, this comes down to an ISP call. When you take a photo, it looks at the potential pictures coming from both lenses and makes a judgement call: Which end-result will look best — the stabilized wide-angle, digitally zoomed? An optical shot from the tele that requires lots of grain and overexposure to capture? Or a combination of the two? It also has a much sharper focus than the forced tele shot, in part because the tele requires a longer minimum focus distance (owing to the shape of its glass) than the wide-angle; even after backing away from my Lego subject, I still couldn't quite get the perspective or the shot as crisp as I could straight out of the Camera app. The resulting photo may technically have more data in it, but the combination of the grain and focus problems made it a huge pain to try and match or improve upon the original wide-angle photo. This isn't to say that the telephoto lens is useless. Not by a long shot: I have dozens of beautiful photos snapped with it that I took in brighter-light conditions, and even more that I've shot with Portrait mode, which lets you shoot exclusively with the telephoto even if the lighting conditions aren't perfect. In addition, when you shoot in 1x or other digital zoom levels, the telephoto will aid the wide-angle in giving you a better picture. I honestly don't think this will mean much for the average user who uses Camera (or social media apps) for their daily snaps; your iPhone's ISP will try and get you the best shot it can, using the best tools at its disposal. And much like Instagram's original forced square format, shooting at 2x mode offers users a different way to compose their shots — quite likely for the better. 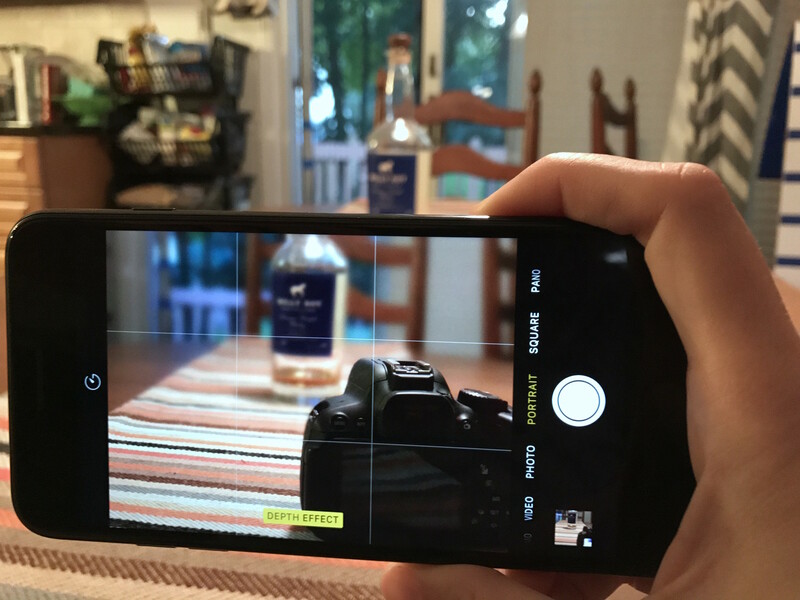 If you're interested in shooting just with the telephoto, you can do what I did and use any third-party app that supports both lenses — Apple wrote APIs just for this reason — or shoot in Portrait mode. Like RAW and manual camera adjustments, these features are available for budding photographers who want to get the most out of them, but fade into the background for users who just want to grab a decent picture. But Apple's ISP is right: You're not going to get great images with the telephoto lens in low light. With no OIS and such a small aperture, it simply wasn't built to do that. For now, if you want to experiment with third-party apps and shooting telephoto, you're best off doing it in brightly-lit areas, or using a stabilizer of some sort.